The nDanville network of rural southern Virginia has long been a favorite of ours (previous coverage is available here). The network has helped Danville go from being notable for having the highest unemployment rate in Virginia to being ranked as the third top digital city in the nation, according to a recent article. Danville City Manager Joe King received the Chairman's Award for his leadership in advancing the development of a modern telecommunications infrastructure in the region, a key factor in Danville's economic development renaissance. King had been the director of the city-owned utility when it drew up plans for a fiber-optic network to be built incrementally until it could connect every home, business, and community anchor institution in Danville Utility's territory. At the time, Danville was suffering tremendously from the loss of tobacco and textile industries. Today, the nDanville net-work connects hundreds of businesses, has sharply re-duced costs for local gov-ernment, health care provid-ers, and local schools, and has introduced more competition into the telecommunications marketplace. Danville Utilities has 44,000 electric meters, half of which are located in Danville (44 sq miles). The others are scattered across over 450 sq miles surrounding the city. The Southern Piedmont Technology Council serves the technology industry in Danville as well as nearby counties and another city. Even in 2004, many in Danville did not have broadband access to the Internet, as outlined in an early document explaining the network. Verizon barely offered DSL and Adelphia offered limited cable modem service. Art Brodsky of Public Knowledge makes a compelling case that the Federal Communications Commission is refusing to take actions that will create thousands of jobs. And his estimate is probably low. One reason is that the FCC over the years succumbed to the Big Telecom campaign to put all the little guys out of business through subterranean means that the public would never see (like charges big phone companies levy to connect to their network). Another is that the FCC gave up the authority over Internet access (broadband), which leads to its current troubles in trying to justify legally how to get an open Internet and will likely lead to future controversies over how to support broadband deployment (universal service). Right now, it doesn't matter whether Democrats or Republicans appoint FCC Commissioners so long as 3 of the 5 commissioners are more concerned with what benefits a few massive companies rather than the vast majority of businesses and citizens. In a recent post about AT&T's funding of astroturf groups to promote its agenda, I took aim at the Internet Innovation Alliance, which has long promoted AT&T goals around the country. Despite this criticism of them, they have produced a very good infographic (included below) that discusses the relationship between broadband and jobs. I would like to draw your attention to number 5 below in particular. #6 is a great explanation of why communities should directly invest in broadband. Local economic growth and secondary investment enabled by broadband expansion is 10 times the initial investment. Think about that. While private companies have long built, owned, and operated most of the broadband networks, they have seriously underinvested. They underinvest because they cannot monetize many of the benefits from broadband. Faster, more reliable connections simply do not translate into more revenue for cable and telephone companies. So the big incumbents have largely ceased investing in next-generation networks. These massive corporations do not care about the growth of secondary investments or other spillover effects from better broadband in communities because it does not change their bottom line -- the one thing they are supposed to prioritize over all other matters. This is why communities should be investing in themselves. Communities do care about secondary investments and spillover benefits from broadband. In fact, they are specifically tasked with investing to benefit the community! So when it comes to maximizing the benefits of broadband, community investments tend to make a lot of sense... and other secondary benefits. The good folks at Public Knowledge have released a report (with a fun video, embedded below) appropriately titled, "4G + Data Caps = Magic Beans." These are the fraudulent version of magic beans - don't expect any beanstalks to data clouds. The 4G offered by major wireless carriers (with the notable exception of Sprint) is a waste of money because it comes with strict data caps. These data caps actively discourage the types of activities that 4G enables. Activities that are made possible by 4G, such as watching movies or uploading video to the internet, are made impossible by the data caps. As a result most users will avoid taking advantage of these new services out of fear of incurring large overage fees. That makes capped 4G little more than a bait and switch, like being sold a handful of magic beans. I have been disturbed by statements from a number of policymakers and elected officials suggesting they believe the future of connectivity in rural America is wireless, specifically 4G because it is better than the horrible DSL that is mostly the only "broadband" connection available in much of rural America. President Obama has suggested that investing in 4G wireless will spur economic development in northern Michigan. Not hardly. What are small businesses going to use the last 29 days of the month after they exceed their data caps? People in Wired West have told me that those in charge of broadband in Massachusetts have at times been dismissive of their project to bring affordable, fast, and reliable broadband to everyone in their towns because the state would prefer to pretend that cheaper wireless solutions will accomplish the same goal. 4G wireless is not the solution to connecting rural America. It could be an interim solution while we build real broadband out to those areas, but it is insufficient as a solution in and of itself due to the many very real limitations of the technology and the business model of those controlling the spectrum necessary to access to it. Minnesota, land of 10,000 lakes, may soon also be the land of Countywide rural FTTH. Yet another County is doing a feasibility study to figure out how it can bring fast, affordable, and reliable broadband access to all of its citizens. Redwood County’s Economic Development Authority (EDA) opted to move forward with a broadband feasibility study that would determine just what the county would need to do in order to get fiber to every premises. The study, which is being conducted by the Blandin Foundation through what is known as the Robust Broad-band Networks Feasibility Grant Program. The grant, which includes up to $40,000 for the county as it addresses the needs of every community and farm site from one end of the county to the other, requires matching funds, which are available through the county EDA. Redwood County is in an interesting area, just north of the Windom area muni FTTH networks and west of the proposed project in Sibley and Renville counties. This study comes not long after Todd County started a feasibility study as well (the the latest on that). 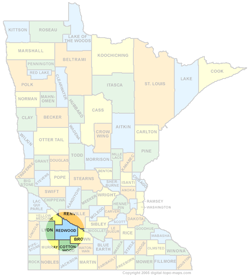 And though we haven't discussed it much on MuniNetworks.org, Lac qui Parle County to the northwest is working with a rural telephone cooperative to bring FTTH to many in their border as well. And then beyond them, we have Cook County going FTTH with their electric coop and Lake County going its own way, both with the assistance of the broadband stimulus awards. Santa Monica's approach to building community owned broadband that puts the community first has been wildly successful. They have not focused on providing residential connections, and likely will not in the future, focusing instead on meeting their municipal needs and businesses to spur economic development. They can deliver up to 10Gbps to businesses that need it and they have connectivity throughout the City for whatever projects they choose to pursue. This includes free Wi-Fi in parks, controlling traffic signaling (prioritizing mass transit, for instance), and smart parking applications. On top of all that, their investments have saved more than a million dollars that would have been wasted on slower, less reliable connections provided by leased lines. In the matter of controlling traffic signals, Santa Monica wants all intersections with fiber-optics. Arizona Avenue, the Mid-City area and the city's office district will all be getting makeovers if the City Council approves two contracts that will connect 40 signalized intersections to City Hall's centralized traffic control system. The work represents the fourth phase in a five-phase effort to connect all of Santa Monica's intersections using fiber optic cables. Some signals will need to be fully replaced, while others can get by on smaller upgrades, according to the staff report. Don't miss this hour long interview between Craig Settles and Jory Wolf, the brains behind Santa Monica's success. Wright said J2, which specializes in providing high-tech software to law enforcement agencies to handle dispatching, records management and other related functions, needed to have the highest speed, most dependable Internet service available. He said TUB, through its LightTUBe broadband communications service, provides exactly what his company needs to thrive and expand. "What LightTUBe has is top of the line," Wright said, adding that normal cable TV service and higher speed digital subscriber line, commonly referred to as DSL, were not adequate to meet the company’s volume and demand. Sounds like confirmation of the story we we just wrote about AT&T's CEO admitting DSL is obsolete. Congratulations to Tullahoma for making smart investments in its own future. In a Q&A following a speech at the National Association of Regulatory Utility Commissioners, AT&T CEO Randal Stephenson candidly called DSL obsolete. This echoes not only our view, but that of hundreds of communities who have built their own networks upon realizing they cannot be competitive in the modern world with DSL. Interestingly, AT&T still has millions of customers that use its DSL product. And it has announced its super-DSL offering called U-Verse is finished -- no doubt surprising many state-house policymakers that AT&T had convinced they would invest in communities. The context of his comment was that DSL is no longer competitive with cable in broadband capacity (and often reliability) -- something we documented in our video comparing different types of networks. We would argue that U-Verse itself is not competitive with cable due to its greatly constrained upstream speeds -- even worse than cable networks typically experience. So, to recap -- we have yet another admission from the private sector that it is delivering obsolete broadband services to our communities. How can there be any surprise that so many more communities are considering building their own networks to create economic develop, increase quality of life, and generally be competitive in the digital economy. If AT&T can barely keep up with the investment necessary for our communities, how can far less profitable companies like CenturyLink and Frontier? They can't. But that doesn't stop them from advertising the hell out of their obsolete networks. Smart communities will choose self-determination rather than betting on last-generation networks run by distant, unaccountable corporations. We noted Palm Coast FiberNET when it opened for business but haven't had a chance to revisit it until now. Broadband Communities has featured it with a Muni Fiber Snapshop in the 2011 May/June issue. The network, available for business use in some areas, has 22 customers, including the city's largest employer. Without this muni investment, that employer would have had to leave town due to the non-competitive alternatives from incumbent providers. Two service providers operate on the muni network, offering data and voice services as well as computer backup. Schools and medical facilities are also benefiting from much lower prices for the telecom services they need. Craig Settles recently interviewed Dan Speers, the Executive Director of the Pulaski-Giles County Economic Development Council, focusing on the publicly owned PES Energize muni FTTH network. There’s a printing operation here with their corporate headquarters in Los Angeles. They have to be able to send artwork all the time to headquarters. There’s a guy who works developing catalogue books that are published by an outfit in Canada. Before the network it would take him six hours to upload materials and now it’s done in minutes. One company has their offices on the north side of community and the manufacturing plant on the south side. They’re always sending large data files back and forth. Hospitals here can upload and download files such as x-rays, MRIs, and CT scans immediately between other hospitals and doctors 75 miles away in Nashville. Patients don’t have to be transferred there, and they don’t have paper records that have to be carried by hand to specialists like they did in the old days. All of this saves lives and it saves money. From a Tennessee perspective, first put us on a level playing field with the telcos. Allow municipalities to get into the business with none of the restrictions we have. We wanted to be able to wholesale our network services. Take Lawrenceberg, for example. They have no broadband and the telcos flat out refuse to build it there. We can expand our network over to them and they’d save $3 Million. But with the law the state legislature passed, we can’t serve them because they’re out of our area. If we shared head-in facilities, this would go a long way for economic development there.